Girls Wear Blue Too: Pizza loaf! 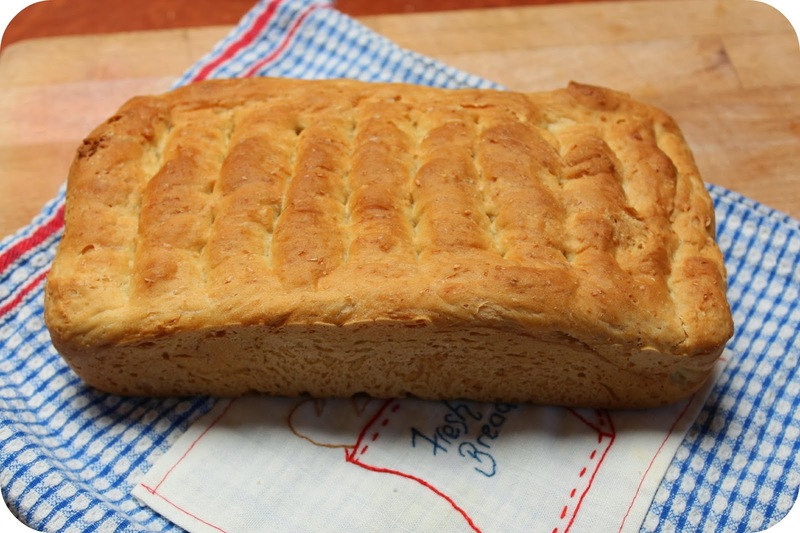 So I went ahead and pulled out my artisan bread in 5 minutes a day book and made up a batch of the soft american style sandwich bread as I had recorded in my last post. However this time my little Miss did not enjoy this type of home baked bread saying the texture was the problem, though it was well received by the little Mr who particularly enjoyed the crust! I had made two loaves from the fresh dough after its rest periods and prior to refrigeration. This left me with one portion of wet dough left in the fridge and I decided to try something a bit different with this piece. After a couple of days I took it out and incorporated a little more flour which enabled me to knead it a little, then I divided it in half and used my rolling pin to flatten the first piece. 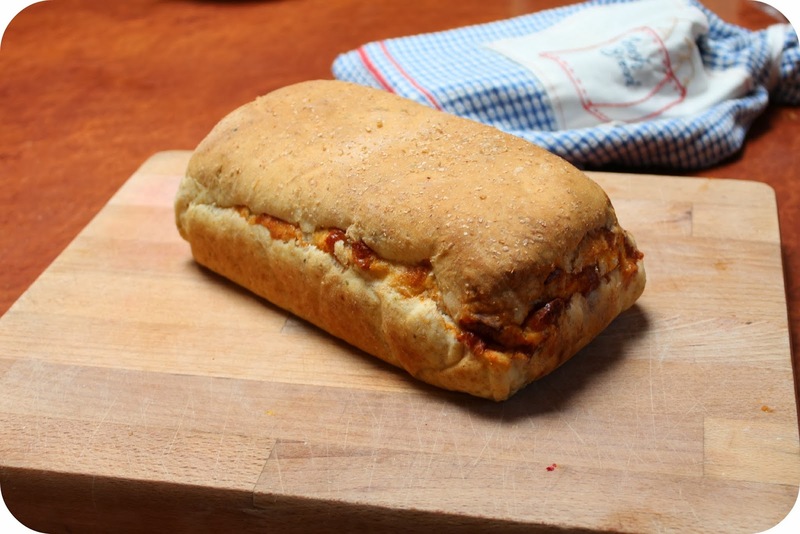 I topped this irregularly shaped piece of flattish dough with some sauce and cheese and a sprinkling of bacon. It was then rolled it up to form a sausage shape with ends folded back up to neatly enclose it all. I took the second piece and flattened it in the same manner, then added sauce and a little grated cheese to its surface, I used this second piece to wrap the fist piece like a gift, wrapping it around and again folding up the ends to neatly encase the sausage shaped piece. I lined my bread tin with baking paper and placed this loaf in with the seams face down. I left it to rest for the recommended 1 hr 40min, second rest and baked it for about 35 minutes in the oven at 180 degrees. 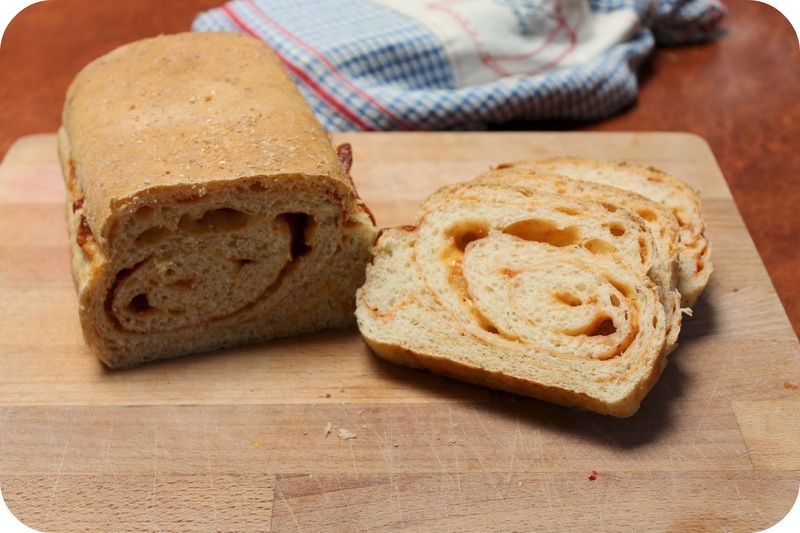 The result a gorgeously risen loaf of somewhat dry, but nonetheless delicious pizza bread! I have to consider this as a successful experiment and re entry into the wonderful world of bread baking. Isn't it lovely when a risk pays off. It really is tasty, I'm thinking up other goodies to put inside. Doesn't that look good and so different...lots of thoughts must have been going through your mind when you saw the difference. Ah thanks Sue, yes I must say I was excited to see the beautiful rise in the pizza loaf after the second rest, when compared to the original two.